I am horrible at making breakfast for the most part. It's not even that breakfast is that complicated, but it's probably the meal I struggle with making the most. It probably doesn't help that I'm just not a big breakfast eater. It's a serious struggle most mornings if it's not something that can be prepped the night before. Let me tell you how unexcited my kids, let alone the hubby are when I announce we are having oatmeal again for breakfast. That is not what great childhood memories are made of. 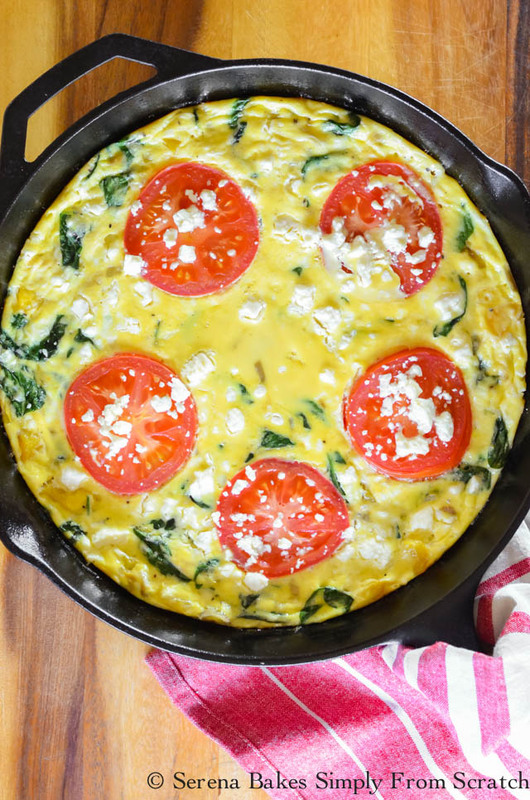 But they love this Feta Spinach Tomato Frittata as much as I do. I also love it's an easy way to up the families veggie intake without them realizing what I'm up to. It's been my goal the last few months. My other go to breakfast at the moment is Sautéed Greens splashed with apple cider vinegar with a runny egg. The kids looked at me like I was a little crazy the first morning I served sautéed greens for breakfast, but now they've been requesting it pretty regularly. Colt even made it for breakfast last week after I had a neurotomy on my lumbar nerves to help with pain control. If your like me, and struggle with breakfast ideas here's where you can find all my favorite: Breakfast Recipes. The all time most requested recipe is Puff Pancakes. I could live on those for the rest of my life, and be totally content. I didn't include step-by-step photos with this recipe since I made a video, and it's so similar to my Spinach Fontina Frittata, but it's basically the same. Just a small change in ingredients. Make sure to grab the easy peasy printable recipe below. 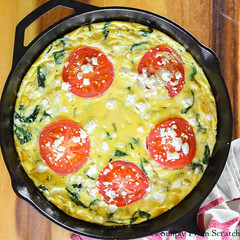 Feta Spinach Tomato Frittata is the perfect easy breakfast recipe from Serena Bakes Simply From Scratch. In a heavy duty oven safe skillet like cast iron add olive oil, butter, and onion. Cook over medium-high heat until onion starts to caramelize. Add spinach, and bell pepper. Cook until spinach is wilted, and any water cooks off. Spread vegetables evenly over bottom pan. Turn heat to medium. In a medium size bowl whisk together eggs, milk or half & half, a pinch of salt, and a pinch of pepper, until well combined. Pour eggs over the top of vegetables, and add 1/2 cup feta cheese. Gently stir until eggs barely start to thicken, but not set. Cover with remaining 3/4 cup feta cheese, and tomato slices. Cook for about 4 minutes until edges just start to set. Carefully place in oven and bake for 16-18 minutes until eggs are set and just barely brown.